With the MyToyota app everything you need is now all in one place. Would you like to save 4c a litre on fuel? 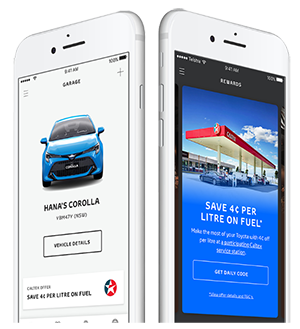 Just download our free myToyota app and shop at any participating Caltex service station. If you are travelling, or planning to travel, in or around Rockhampton and surrounds you can call into any participating Caltex Service Station to save. This is not only available in your area but anywhere in Australia. You may find your closest participating Caltex Service Station simply by using the myToyota app to start saving. To participate in this wonderful offer you must register your Toyota vehicles details, after you have downloaded the free myToyota app, and log in. This will give you your daily code which you must show at the desk before payment. Not only do you save on fuel, there is the availability of booking a service, accessing your digital logbook as well as other rewards that are only offered to users of the myToyota app. Download the myToyota app to start saving now. For being a valued Toyota guest, you will get offers and discounts off Caltex fuel stations wherever you go. Toyota ownership is more than just owning a car, it’s about a lifetime of adventures that start from our online GoPlaces magazine.